In the pursuit of the perfect glowing cheeks I truly believe I stumbled across the secret of ALL secrets of how to achieve this. My personal opinion is that it has more to do with the technique than the product but it doesn't hurt that this product is amazing. I have been trying to decide if I should show you the results first or the steps to get the results. Which way would be more suspenseful? Okay, I decided to show the outcome first, then lay it out step by step for you guys. I really don't know why I have never tried this technique or the at least no one has ever told me about it! Is there some secret glowing cheeks club that I was not privy to admission into? Oh well, I was experimenting in the bathroom on a particularly boring makeup day and I stumbled across something that made my cheeks look like this! Unfortunately my camera washed out the color a bit but let me tell you the effect. It was a glowing pink that looked like it was coming from within. This look is very youthful, like a rosy cheeked doll. It was reminiscent of the queen of glowing cheeks herself, Kim Kardashian. Who doesnt want that effect? Onto the magic products and technique, I will take you through step by step. On a clean, moisturized face take your foundation brush (mine is beauty of essence from CVS around 8$) and dab it onto MAC's Process Magenta Paintstick (this is the magic product, this thing is PIGMENTED beyond belief, creamy and matte). You can try this out with any very bright pink cream blush or base. It needs to be SUPER bright though. Blend it in with your fingers or brush. 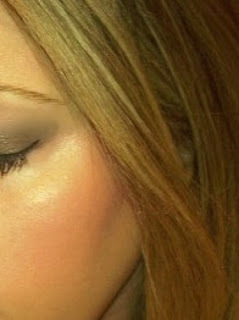 NOW put on your foundation or tinted moisturizer (I use Laura Mercier's Tinted Moisturizer). 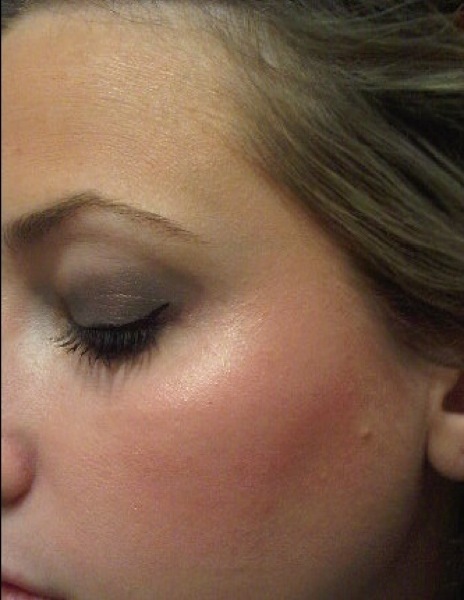 I tapped a tiny bit of NARS "Desire" blush along the cheekbones. I then highlighted the actual tops of the cheek bones with DIORS Amber Diamond shimmer powder (you can use any highlighter, MACs MSF, NARS Albatross, MAC CCB's) Anything that has a slight opalescent shimmer to it. This makes those babies POP! An extra step that you can take if you have rounder cheeks is that you can take a bronzer and SLIGHTLY contour into the hollows of your cheeks ( MAC's Taupe is perfect for that, or any bronzer for that matter). VOILA. What do you think? Really, the key to the whole technique is the cream based UNDER your foundation or whatever to really make it look like real skin that is blushing and glowing from under the makeup, not just color sitting on your skin. It is important that the pink cream blush or base is VERY bright as the foundation will tone it down and you still want to have some strong pink showing though (MAC's Pink Vivid pain stick would work, MAC's Pink Shock CCB would also, I think Illamasqua has a cream blush that would work well. Although, the paintstick is the perfect texture for this, not greasy, just perfect). I have been doing this every day since I figured it out and not deviating from these products. Try it out and let me know how it goes and your results! Enjoy! Ahh I'm craving that paintstick!!! Yinka! HAHAHA i am cracking up from you, as always. You are such a damn firecracker! I love the brush also, honestly who needs an expensive foundation brush when you have this? Try out the mac paintsticks I am sure you will love it! cbsg- This for sure will last forever, its SO pigmented you only need a TINY amount! Princess Livia- This would be perfect for you! Would look amazing. Also, you can wear it as a lipstick as well! Sarah- Thank you, you are so sweet, but trust me, this is helping my cheekbones out! Try it out, let me know how it goes! Lexi- Thanks! 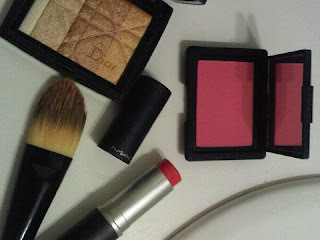 the Dior one is great, a less expensive highlighter option is NARS albatross, and I love MAC's By Candlelight too! @ FACE IT- By Candlelight is amazing! This is gorgeous, dear! Again, that Dior Amber Diamond palette is taunting me...I need to just get it already! I'm so happy the Paintstick worked for you - I should try this, but the magenta wouldn't work for my skintone...I wonder if I can get the orange paintstick instead and try this? Hi Joey! You need the amber diamond. The paint stick is fab, maybe try the orange! Let me know how it goes. The شركة تنظيف خزانات بالرياض Providers Section of Services Providers contains a personnel that is normally devoted to offering a clean and comfy environment for the whole Bryn Mawr Community. I have always been 52, I have got utilized home cleaners both private and solutions on and off for about 22 years right now. Marin is usually well known for its progressiveness in the area of sustainability, and we thought a great support to both Marin's environment and its residents would be a healthy cleaning support. They have to pay for business insurance, bonding, licenses, gasoline, supplies, automobile wear and tea, taxes, 100% of their social security taxes (employees normally pay only half) advertising, travel time, etc. I no longer charge by the hour; I charge by the work. Give us a call since you'll end up being searching and probably you might like to provide us a possibility to display you what a washing company's behavior should end up شركة تنظيف منازل بالرياض عمالة فلبينية being toward their respected clients. How very much would you charge if you had been employed as a housecleaner to clean a 5 bedroom 3 bathroom home with living room dining room 2 kitchens a den and individual family room. You men washing should talk to for great pay out trigger washing is normally challenging labor!!! In the time it required you to create your comment you could possess washed under that bed and carried شركات تنظيف بالرياض عمالة فلبينية out a few sit-ups. G.Beds. Just people of course should also end up being contemplating the prices of cleaners. They obtain to understand our home and what/how we wish to obtain stuff carried out. It takes all jobs and hardworking people to maintain a solid overall economy and the assistance market up and operating. Most of us understand that by the end of the time our scrubs and shoes and boots are dirty but شركة تنظيف منازل بالرياض the majority of us understand how to deal with our even when we get home. This is usually a very good article but I do take exception to the comment that most individual cleaners are "inherently fly-by-night". I have got been offering home washing and personal treatment for ten years, for elderly people who cannot perform many of their very own chores.I was a older also. Our personal encounter with فني مكيفات سبليت بالرياض companies offers by no means been a good one. I salvaged the expert bathroom for my 3 kids to clean and each person in the house was responisble for cleaning their personal bedroom.